Sopapillas are soft pillows of fried dough, typically served as a dessert covered in cinnamon and sugar or drizzled with honey. 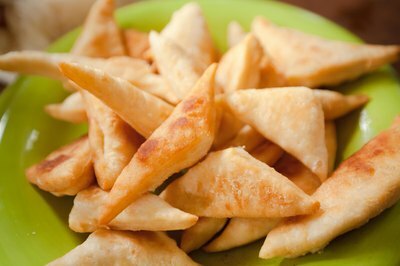 These puffy little triangular-shaped pastries are similar to doughnuts or beignets. Whether you want to serve them as a sweet treat or a savory one, stuffed with spicy beef and topped with green chiles and cheese, you won't have to travel to the Southwest to get them. 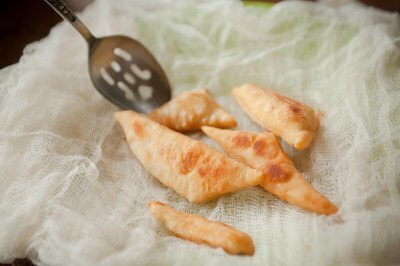 Using the sopapilla dough recipe of your choice, you can create these delightful treats yourself. Combine the dry ingredients used to make your sopapilla dough in a large mixing bowl using a whisk. These ingredients typically include all-purpose flour, baking powder, salt and sugar. 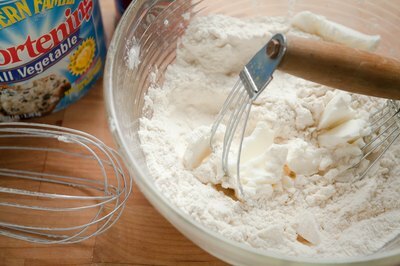 The whisk will aerate the flour to create a fluffier, softer sopapilla without using a sifter. Cut lard or vegetable shortening into the dry ingredients with a pastry blender. Pour your wet ingredients, such as milk or warm water, into the bowl while mixing the ingredients with your hands to form your dough. Knead the dough on a lightly floured surface for 2 to 3 minutes. The dough should have a smooth and slightly elastic consistency. Add additional water or flour as needed to achieve this consistency. 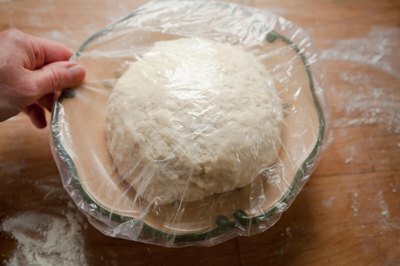 Wrap the dough in plastic and chill it in the refrigerator for 30 minutes to 2 hours. This will make it firmer to roll out and cut. 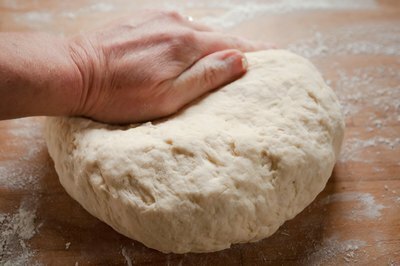 Roll the dough out onto a lightly-floured surface with a rolling pin to about a 1/4-inch-thick circle. 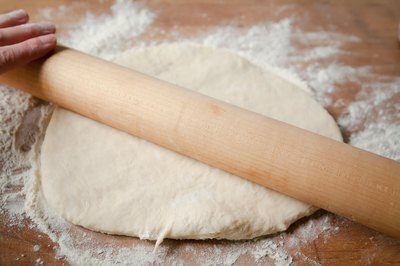 If you have a large amount of dough, divide it into smaller portions, then roll them out. 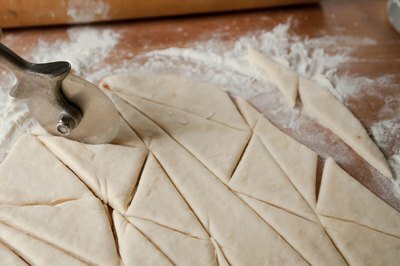 Cut the dough into triangles that are 3 to 6 inches across using a knife or pizza cutter. 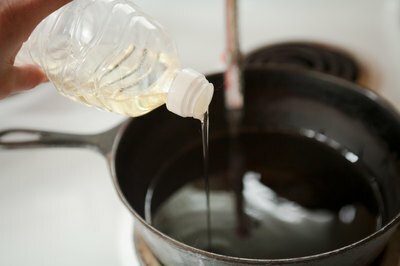 Pour vegetable oil into a pot at a depth of about 3 inches. Heat the oil over medium-high heat to 375 degrees Fahrenheit when tested with a cooking thermometer. Add a small bit of dough to the oil -- it should sizzle if it's ready. 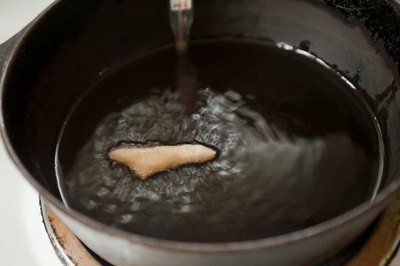 Drop three to four sopapillas into the oil at a time. The sopapillas will rise to the top as they puff up and cook. When the sopapillas rise, cook each side for around 2 minutes. Use a slotted spoon or fork to flip them over. 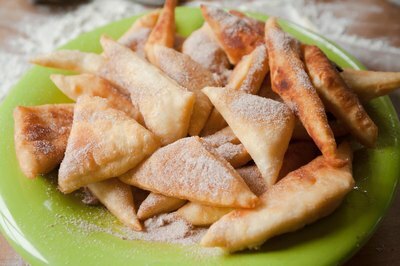 Remove the sopapillas and drain them on plates lined with paper towels, which will absorb the excess oil. Discard the paper towels under the sopapillas. 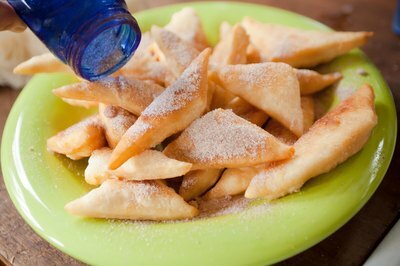 Drizzle the sopapillas with honey or sprinkle them with powdered sugar or a cinnamon-sugar mixture. If you plan on using the sopapillas for a savory dish, skip the sweet toppings.